After fertilization, coral embryos form free-swimming larvae after a few days of development. There are various methods that can be used to culture and rear coral larvae through the development phase until they are competent to settle. Any of these methods will be more successful if you begin with high fertilization rates. When fertilization is low, the unfertilized eggs die and decompose over the first 24-48 hours, fouling the rest of the culture as there are no viable ways to separate the unfertilized eggs. Over the course of development, the embryos begin floating at the water surface, but they gradually lose buoyancy as their lipid stores are used and they begin swimming, taking them toward the bottom. This means there are slightly different handling techniques as the larvae change position in the water column. Generally, the strategy is to keep the larvae in an environment of appropriate temperature and water quality. Larvae can be kept in standing bins, coolers, or small tabletop dishes if they are maintained under optimal temperatures (generally 23-29°C or 73-84°F ref , but this depends on ambient reef temperatures in your location). 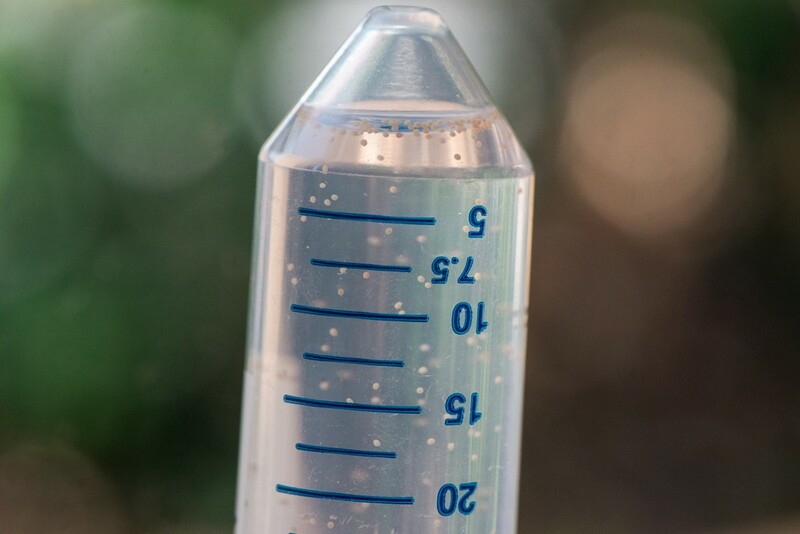 The key to maintaining good water quality is to keep larvae at a low density (which can be difficult in the early stages when they float and clump at the surface) and cleaning water to remove excess sperm cells. In the early stages when the larvae are floating, the fat-separating pitchers (as described in the Fertilization section) can be used for water changes. When the larvae are more fully developed and swimming, the cultures can be filtered through a sieve with fixed-size mesh to retain the larvae. Pipettes, squirt bottles, siphoning tubes, and sieves are all useful tools. If more sophisticated plumbing is available, various sorts of drip-through culture vessels can be employed with temperature control and filtration. Lastly, in situ floating pools may be used to contain large numbers of developing larvae through settlement, but there are many considerations when choosing an appropriate site for these pools (e.g., water quality, exposure to waves, rain storms, or sunlight, securing the pools, etc.). Fixed-size mesh, depending on the species and size of larvae, can be incorporated into culture vessels to retain larvae while allowing some water exchange. The progress of larval development can be monitored if a dissecting microscope is available. The rate of development, and hence the time until the larvae are ready to settle, will depend both on the coral species and on the temperature, as larvae develop faster with warmer water temperatures. Thus, regular monitoring is recommended during this phase. Click play to view new coral larvae. Video © Anastasia Banaszak. After a few days, coral larvae will be ready to settle and develop into a coral polyp. The next section describes larval settlement onto artificial and natural substrates. Maintain appropriate water temperature and keep larvae dilute to maintain water quality. Unfertilized eggs will reduce water quality as they decay; many water changes will be necessary. Evaporation from coolers should be avoided as this will increase salinity.